WASHINGTON – Rep. Tulsi Gabbard (D-Hawaii) was joined Thursday by bipartisan members of Congress, victims of sexual assault in the military and organizations who assist victims of military sexual trauma (MST) to announce new bipartisan, bicameral legislation that would reform the military justice system. In response to reports that females in the military who reported sexual assaults to their superior officers were ignored or even retaliated against, the bill would remove the prosecution of such crimes from the chain of command. “Our legislation ensures that military sexual assault victims who come forward are guaranteed a safe, fair, and transparent process, free from fear of retaliation,” said Gabbard, who later delivered remarks on the House floor about the bill. “We in Congress and leaders in the Defense Department need to keep shining a spotlight on this very disturbing problem. We cannot and will not let this issue lie. 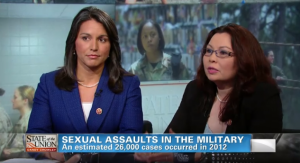 Gabbard appeared with fellow Iraq War veteran Rep. Tammy Duckworth (D-Ill.) on CNN’s “State of the Union with Candy Crowley” on May 12 to discuss the issue. According to a report released last week by the Defense Department, an estimated 26,000 cases of sexual assault occurred in 2012, a 37 percent increase from the previous year. Another report released by the Defense Department late last month showed that more than 1 in 5 female servicemembers reported experiencing unwanted sexual contact while serving in the military. The Military Justice Improvement Act would for the first time remove the decision whether to take a case to special or general court-martial completely out of the chain of command and give that discretion to experienced military prosecutors for all crimes punishable by one year or more in confinement, except crimes that are uniquely military in nature, such as disobeying orders or going AWOL. • Codifies Defense Secretary Chuck Hagel’s proposed changes to the Uniform Code of Military Justice’s Article 60 so that the convening authority may not (a) set aside a guilty finding or (b) change a finding of guilty to a lesser included offense. The legislation further alters Article 60 to require the convening authority to prepare a written justification for any changes made to court-martial sentences. • Provides the offices of the military chiefs of staff with the authority and discretion to establish courts, empanel juries and choose judges to hear cases (i.e. convening authority). This legislation does not amend Article 15. Commanding officers will still be able to order non-judicial punishment for offenses not directed to trial by the prosecutors. Rep. Dan Benishek (R-Mich.), a member of the House Committee on Veterans’ Affairs, joined Gabbard to introduce the legislation in the House of Representatives. Sens. Kirsten Gillibrand (D-N.Y.), Susan Collins (R-Maine), Barbara Boxer (D-Calif.), and Mike Johanns (R-Neb.) led the introduction of the legislation in the Senate.